When customers accept the quote online, you can have them make payment immediately. You get notified when they view the payment page. No more following up with the customer wondering when they are going to pay you. The QuoteValet subscription also allows you to collect deposits, progress payments, balances, and even export payments to QuickBooks. 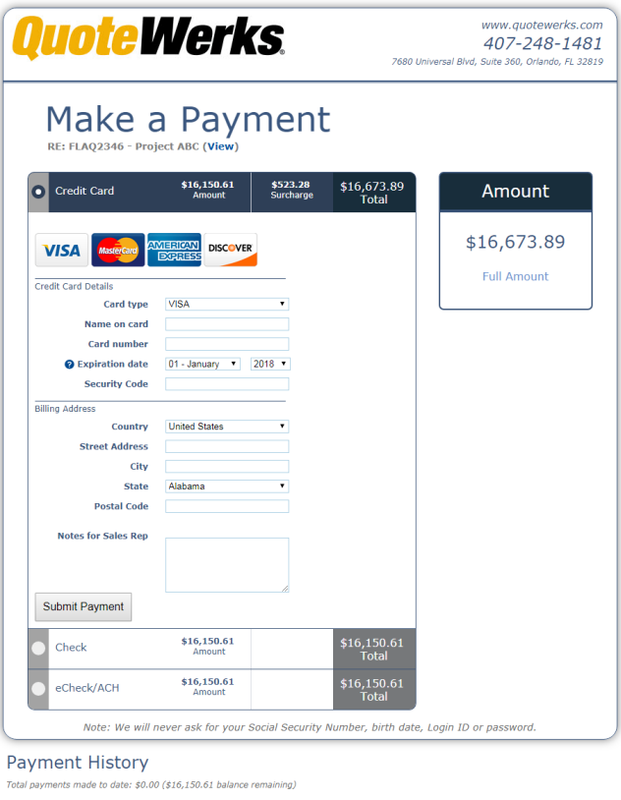 Your customers can pay by credit card, e-check, PayPal, lease, and more. You are not limited to just a handful of payment Gateways. QuoteValet supports over 80 different Credit Card and ACH gateways. You can specify that a % or fixed amount surcharge or discount be applied to the quote when that particular payment option is selected. This is useful, for example, in charging the customer a 3% surcharge if they pay by credit card, or a 3% discount if pay by check, or a $15 fee if pay by wire transfer. There is also an option to automatically disable a payment method, like credit card when the quote total is over, for example, $3000. Learn more about getting paid with QuoteValet.